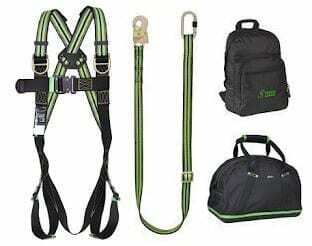 Comfort and safety are vital when working at height, so with our 3 point restraint harness kit you can achieve both with a high quality rage of components provided. You get a harness, adjustable lanyard and kit bag to boot, which makes it a great value purchase. What comes with the 3 Point Restraint Harness Kit? A combination of crucial parts is included in this fully featured 3 point restraint kit. The comfort harness has a pair of D-rings up front, while on the rear there is a third D-ring to keep users attached to several anchor points at once. There are different harness sizes on offer, catering to small and large users alike. You can also make adjustments to the shoulder and thigh straps of each model to get the fit just right. The lanyard is also adjustable, with a shortest length of 1.4 metres and a longest length of 2 metres available on the fly. It is made using 30mm polyester webbing, which is durable and resistant to corrosion. Meanwhile the alloy snap hook and karabiner which sit at opposite ends of the lanyard are sturdy and simple to use. Additional lanyards can be found here. Browse our full height safety equipment line-up, or check out specific alternatives like the single point restraint kit if you are seeking something different to this 3 point example. Can you give me more Information on this Equipment? Of course, you just need to contact Rope Services Direct with a call to our hotline or an email sent via our website. The number to dial is 01384 78004 and our contact page is the place to find our other details. 3 Point Restraint Harness Kit Overall rating: 5 out of 5 based on 6 reviews.